I love reading novels and short stories that genuinely cover various angles of human relationships. The way nuances of characters are portrayed, human frailties and sensitive side of human psyches are exposed, flitting moments of epiphany and melodrama, and all make my heart go numb for a while. I love this trance. I keep searching these kinds of books online, though I am aware that Indian writers are less into this literature, well lately I came across Deepa Agarwal’s collection of short stories where in her female leads were seeking questions to those answers probably never existed. 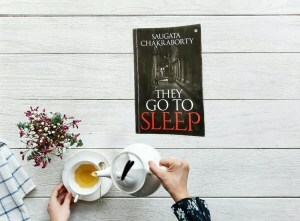 This time while browsing Facebook book review groups I came across this good-looking and promising collection by Saugata Chakraborty, ‘They Go To Sleep’. In the case of collection of short stories, I read randomly or I read the title story first. I liked the stories so much that in my second round of reading I read them in order, from first to last, as I had a feeling that stories are not interconnected. Rather an amusing experience is built around the book when you know that each story is going to take you on ride to a place or person that bears no familiarity at all. But it all makes up for a gripping read. Saugata’s description of metro cities lifestyle and everyday challenges run in the backdrop like banter and above it he builds his characters’ idiosyncrasies which create unforgettable moments both visually and emotionally. Last moment change of heart, pre-meditated betrayals, unexpected twists and disappointments, small acts of cruelty, journeys that take you back to where you started and more; indeed this collection is going to stay for longer with you. Saugata portrays a sensitive side of human psyche probably impacted by hedonism, greed, aspirations, quest, and purpose. In twelve stories I felt as he covered a millions of complex human emotions. Overall, a good read with 4 out of 5 stars.